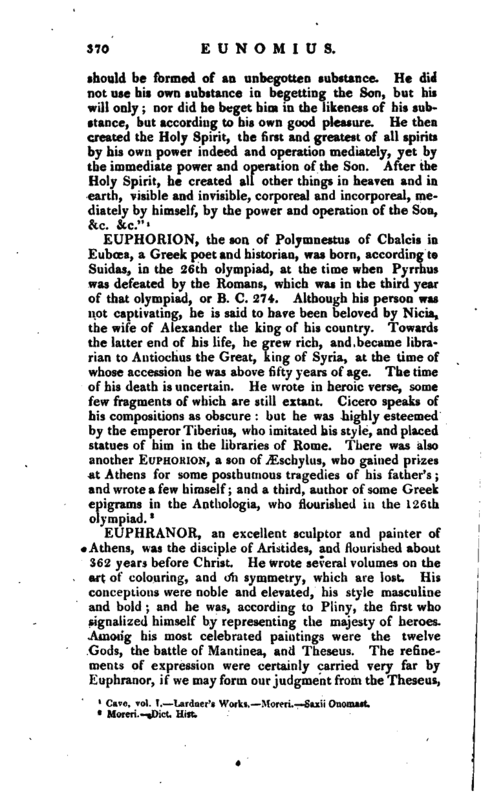 , an Arian heretic of the fourth century, was born at Dacora, a town of Cappadocia and was the son of a peasant but not relishing a country life, he went to Constantinople, and afterwards to Alexandria, where he became the disciple and secretary of Ætius, but was abundantly more subtle than his master, as well as more bold in propagating the doctrines of his sect, who have since been called Eunomians. He then returned to Antioch, where he was ordained a deacon by Eudoxius, bishop of that place; but being sent to defend Eudoxius against Basil of Ancyra, before the emperor Constantius, he was seized upon the road by the partisans of Basil, and banished to Mida, a town, of Phrygia. 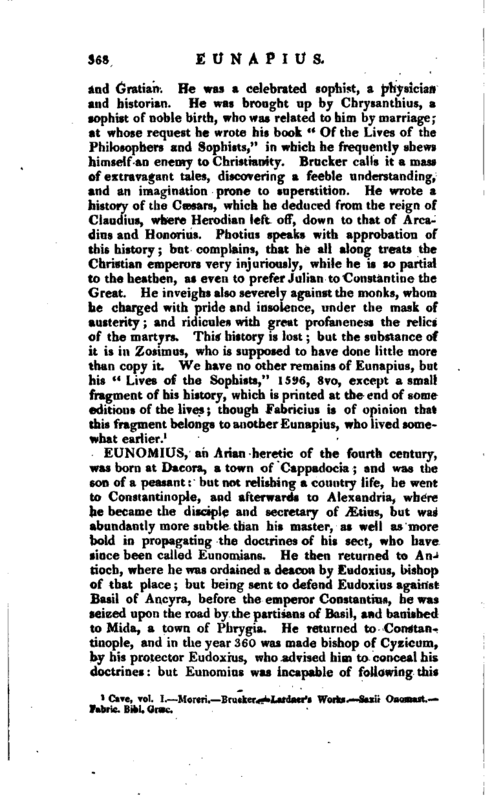 He returned to Constantinople, and in the year 360 was made bishop of Cyzicum, by his protector Eudoxius, who advised him to conceal his doctrines: but Eunomius was incapable of following this | advice, and gave so much disturbance to the church by the intemperance of his zeal, that Eudoxius himself, by the order of Constantius, was obliged to depose him from his bishopric, and he was that year banished again. He retired to a house "which he had in Chalcedonia, where he concealed the tyrant Procopius in the year 365, and being accused by the emperor Valens of having afforded shelter to his enemy, was by him banished a third time to Mauritania. Valens, bishop of Mursa, got him recalled; and he was next banished to the isle of Naxos, for disturbing the peace of the church. 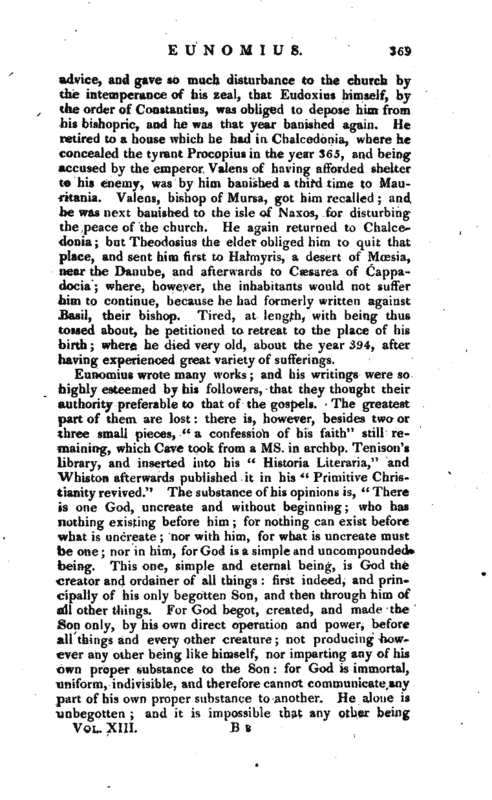 He again returned to Chalcedonia; but Theodosius the elder obliged him to quit that place, and sent him first to Halmyris, a desert of Mossia, near the Danube, and afterwards to Caesarea of Cappadocia; where, however, the inhabitants would not suffer him to continue, because he had formerly written against Basil, their bishop. Tired, at length, with being thus tossed about, he petitioned to retreat to the place of his birth; where he died very old, about the year 394, after having experienced great variety of sufferings. Cave, vol. I.—Lardner’s Works.—Moreri.—Saxii Onomast.